The GK125-Q is the mini version of our GK150-Q. 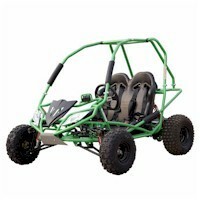 Just like all other junior Go Karts, it has a parent-adjustable throttle limiter plus many other safety features. Key features are: * Electric Start. * Automatic Transmission. * Hydraulic Disk Brake. * Forward and Reverse.